I normally cut my hair short, and my tool of choice has been a common hair/beard cutter, bought in a electrical shop here in Norway. But the last ones have not really been up to the task. 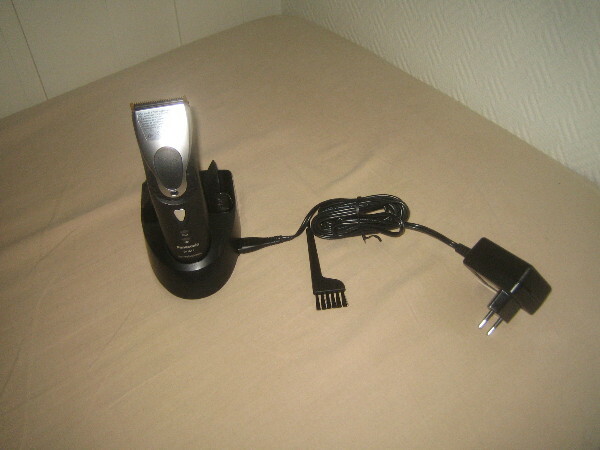 My last cutter, some model from Braun, could only cut a few of my hairs at the time, and cutting my head took forever. And the one before that did not work very well either. We have looked for something better for a while, but it was not until I ended up visiting a hairdresser that we discovered that there are indeed better tools available. But these are not marketed and sold to "regular consumers". The hair saloons can get them through their suppliers, but their suppliers only sell companies. The models they sell, are very different from the ones available from Elkjøp and Lefdal. The main difference is their efficiency. It would cut my hair in 5 minutes, instead of the 30-40 minutes required by my impotent Braun. The hairdresser I visited had a Panasonic ER160, which unfortunately is no longer available from the producer. But I found it had a successor, the Panasonic ER1611. The next step was to find somewhere to buy it. This was not straight forward. The list of suppliers I got from the hairdresser did not want to sell anything to me. But searching for the model on the web we found a supplier in Norway willing to sell it to us for around NOK 4000,-. This was a bit much. We kept searching and finally found a Danish supplier selling it for around NOK 1800,-. We ordered one, and it arrived a few days ago. The instructions said it had to charge for 8 hours when we started to use it, so we left it charging over night. Normally it will only need one hour to charge. The following evening we successfully tested it, and I can warmly recommend it to anyone looking for a real hair cutter. The ones we have used until now have been hair cutter toys. NUUG-styremedlem Hans-Petter Fjeld meldte nettopp at han har sendt inn NUUGs høringsuttalelse angående Difi sin standardkatalog v3.1. Jeg er veldig glad for at så mange bidro og sikret at vår stemme blir hørt i denne høringen. Anbefaler alle å lese våre to sider med innspill. HTC One X - Your video? What do you mean? "Drøy brukeravtale: HTC kan bruke MINE redigerte videoer kommersielt. Selv kan jeg KUN bruke dem privat." "Arrogant user agreement: HTC can use MY edited videos commercially. Although I can ONLY use them privately." I've been unable to find the text of the license term myself, but suspect it is a variation of the MPEG-LA terms I discovered with my Canon IXUS 130. The HTC One X specification specifies that the recording format of the phone is .amr for audio and .mp3 for video. AMR is Adaptive Multi-Rate audio codec with patents which according to the Wikipedia article require an license agreement with VoiceAge. MP4 is MPEG4 with H.264, which according to Wikipedia require a licence agreement with MPEG-LA. I know why I prefer free and open standards also for video. Tags: digistan, english, h264, multimedia, personvern, standard, video, web. I januar i fjor startet vi i NUUG arbeid med å gjøre informasjon om hvem som har stemt hva på Stortinget enklere tilgjengelig. I løpet av få måneder fant vi sammen med organisasjonen Holder de ord som arbeidet mot et lignende mål. Siden den gang har vi fått tak i maskinelt lesbart informasjon om hvem som stemte hva mellom 1990 og våren 2010, og tilgang til stortingets nye datatjeneste som har informasjon fra høsten 2011 til i dag. Det gjenstår litt arbeid med det første datasettet, men datasettet fra høsten 2011 er klart til bruk. Begge datasettene er tilgjengelig via git. På Go Open i morgen lanserer NUUG sammen med Holder de ord en test-tjeneste som viser hva som er og blir behandlet på Stortinget og hvem som har stemt hva siden oktober i fjor. Du får herved mulighet til å ta en sniktitt. Here in Norway, the Ministry of Government Administration, Reform and Church Affairs is behind a directory of standards that are recommended or mandatory for use by the government. When the directory was created, the people behind it made an effort to ensure that everyone would be able to implement the standards and compete on equal terms to supply software and solutions to the government. Free software and non-free software could compete on the same level. But recently, some standards with RAND (Reasonable And Non-Discriminatory) terms have made their way into the directory. And while this might not sound too bad, the fact is that standard specifications with RAND terms often block free software from implementing them. The reasonable part of RAND mean that the cost per user/unit is low,and the non-discriminatory part mean that everyone willing to pay will get a license. Both sound great in theory. In practice, to get such license one need to be able to count users, and be able to pay a small amount of money per unit or user. By definition, users of free software do not need to register their use. So counting users or units is not possible for free software projects. And given that people will use the software without handing any money to the author, it is not really economically possible for a free software author to pay a small amount of money to license the rights to implement a standard when the income available is zero. The result in these situations is that free software are locked out from implementing standards with RAND terms. Because of this, when I see someone claiming the terms of a standard is reasonable and non-discriminatory, all I can think of is how this really is non-reasonable and discriminatory. Because free software developers are working in a global market, it does not really help to know that software patents are not supposed to be enforceable in Norway. The patent regimes in other countries affect us even here. I really hope the people behind the standard directory will pay more attention to these issues in the future. You can find more on the issues with RAND, FRAND and RAND-Z terms from Simon Phipps (RAND: Not So Reasonable?). Update 2012-04-21: Just came across a blog post from Glyn Moody over at Computer World UK warning about the same issue, and urging people to speak out to the UK government. I can only urge Norwegian users to do the same for the hearing taking place at the moment (respond before 2012-04-27). It proposes to require video conferencing standards including specifications with RAND terms. Tags: english, multimedia, nuug, standard, video. Forskning: "GPL gir lokal frihet og kontroll gjennom omfordeling av makt fra produsent til bruker"
Motivasjonen til å skrive denne oppgaven er en personlig undring over hvorfor det primært, og ofte eksklusivt, fokuseres på det økonomiske aspektet ved utredninger om fri programvare er et godt valg for det offentlige. Fri og produsenteid programvare bygger på fundamentalt forskjellige ideologier som kan ha implikasjoner utover økonomiske kostnader. Kunnskapskulturen som er med på å definere fri programvare er basert på åpenhet, og er en verdi i seg selv. Hvordan fordeles handlekraft gjennom lisensieringen av programvaren? Hvilke konsekvenser har programvarelisensen for de ulike brukere? Fri programvare gir blant annet brukeren mulighet til å studere og modifisere kildekoden. Denne formen for frihet erverves gjennom kunnskap og krever at brukeren også er en ekspert. Hva skjer med frihetene til GPL når sluttbrukeren er en annen? Dette diskuteres i dialog med informantene. Jeg har i denne oppgaven samlet inn intervjudata fra IKT-ansvarlige ved grunnskolene i Nittedal kommune, driftsansvarlig og IKT-veilederen for skolene i kommunen, samt IKT-koordinator for utdanning i Akershus fylkeskommune og bokmåloversettere av OpenOffice.org. Den empiriske delen av oppgaven er delt inn i to seksjoner; den første omhandler operativsystemet Skolelinux, den andre kontorprogrampakken OpenOffice.org. Som vi vil se gir GPL lokal frihet og kontroll gjennom omfordeling av makt fra produsent til bruker. Brukerens makt analyseres gjennom begrepene brukermedvirkning og handlingsfrihet. Det blir også lagt vekt på strukturelle forhold rundt bruken av teknologi, og spesielt de økonomiske begrepene nettverkseksternaliteter, innlåsing og stiavhengighet. Dette er begreper av spesiell nytte når objektet som omsettes eller distribueres er et kommunikasjonsprodukt, fordi verdien til et slikt gode for en potensiell bruker avhenger av antall eksisterende brukere av godet. I tilknytning til denne problematikken inneholder oppgaven også en diskusjon rundt åpne standarder og formater. Oppgaven konkluderer med at de «fire frihetene» som GPL-lisensen er laget for å beskytte er av avgjørende betydning for bruken av OpenOffice.org og Skolelinux, i Akershus fylkeskommune såvel som i skolene i Nittedal. Distribusjonen av handlekraft er ikke helt symmetrisk. Det er først og fremst de profesjonelle utviklerne i Skolelinux som direkte kan nyttiggjøre seg friheten til å endre kode, mens en sluttbruker som Nittedal kommune nyttiggjør seg den økonomiske friheten til å kunne distribuere programmene. Det er imidlertid også slik at ingen aktør klarer seg uten alle disse «frihetene». Behind Debian Edu and Skolelinux there are a lot of people doing the hard work of setting together all the pieces. This time I present to you Andreas Mundt, who have been part of the technical development team several years. He was also a key contributor in getting GOsa and Kerberos set up in the recently released Debian Edu Squeeze version. My name is Andreas Mundt, I grew up in south Germany. After studying Physics I spent several years at university doing research in Quantum Optics. After that I worked some years in an optics company. Finally I decided to turn over a new leaf in my life and started teaching 10 to 19 years old kids at school. I teach math, physics, information technology and science/technology. Already before I switched to teaching, I followed the Debian Edu project because of my interest in education and Debian. Within the qualification/training period for the teaching, I started contributing. The advantages of Debian Edu are the well known name, the out-of-the-box philosophy and of course the great free software of the Debian Project! As every coin has two sides, the out-of-the-box philosophy has its downside, too. In my opinion, it is hard to modify and tweak the setup, if you need or want that. Further more, it is not easily possible to upgrade the system to a new release. It takes much too long after a Debian release to prepare the -Edu release, perhaps because the number of developers working on the core of the code is rather small and often busy elsewhere. The Debian LAN project might fill the use case of a more flexible system. I am only using non-free software if I am forced to and run Debian on all my machines. For documents I prefer LaTeX and PGF/TikZ, then mutt and iceweasel for email respectively web browsing. At school I have Arduino and Fritzing in use for a micro controller project. One of the major problems is the vendor lock-in from top to bottom: Especially in combination with ignorant government employees and politicians, this works out great for the "market-leader". The school administration here in Baden-Wuerttemberg is occupied by that vendor. Documents have to be prepared in non-free, proprietary formats. Even free browsers do not work for the school administration. Publishers of school books provide software only for proprietary platforms. To change this, political work is very important. Parts of the political spectrum have become aware of the problem in the last years. However it takes quite some time and courageous politicians to 'free' the system. There is currently some discussion about "Open Data" and "Free/Open Standards". I am not sure if all the involved parties have a clue about the potential of these ideas, and probably only a fraction takes them seriously. However it might slowly make free software and the philosophy behind it more known and popular. Jeg har tenkt meg på konferansen Go Open 2012 i Oslo 23. april. Medlemsforeningen NUUG deler ut prisen for fremme av fri programvare i Norge der i år. Kommer du? It take all kind of contributions to create a Linux distribution like Debian Edu / Skolelinux, and this time I lend the ear to Justin B. Rye, who is listed as a big contributor to the Debian Edu Squeeze release manual. I'm a 44-year-old linguistics graduate living in Edinburgh who has occasionally been employed as a sysadmin. I'm neither a developer nor a Skolelinux/Debian Edu user! The only reason my name's in the credits for the documentation is that I hang around on debian-l10n-english waiting for people to mention things they'd like a native English speaker to proofread... So I did a sweep through the wiki for typos and Norglish and inconsistent spellings of "localisation". These questions are too hard for me - I don't use it! In fact I had hardly any contact with I.T. until long after I'd got out of the education system. I can tell you the advantages of Debian for me though: it soaks up as much of my free time as I want and no more, and lets me do everything I want a computer for without ever forcing me to spend money on the latest hardware. I've been using Debian since Rex; popularity-contest says the software that I use most is xinit, xterm, and xulrunner (in other words, I use a distinctly retro sort of desktop). Well, I don't know. I suppose I'd be inclined to try reasoning with the people who make the decisions, but obviously if that worked you would hardly need a strategy. Recently I have spent time with Skolelinux Drift AS on speeding up a Debian Edu / Skolelinux Lenny installation using LTSP diskless workstations, and in the process I discovered something very surprising. The reason the KDE menu was responding slow when using it for the first time, was mostly due to the way KDE find application icons. I discovered that showing the Multimedia menu would cause more than 20 000 IP packages to be passed between the LTSP client and the NFS server. Most of these were NFS LOOKUP calls, resulting in a NFS3ERR_NOENT response. Because the ping times between the client and the server were in the range 2-20 ms, the menus would be very slow. Looking at the strace of kicker in Lenny (or plasma-desktop i Squeeze - same problem there), I see that the source of these NFS calls are access(2) system calls for non-existing files. KDE can do hundreds of access(2) calls to find one icon file. In my example, just finding the mplayer icon required around 230 access(2) calls. The KDE code seem to search for icons using a list of icon directories, and the list of possible directories is large. In (almost) each directory, it look for files ending in .png, .svgz, .svg and .xpm. The result is a very slow KDE menu when /usr/ is NFS mounted. Showing a single sub menu may result in thousands of NFS requests. I am not the first one to discover this. I found a KDE bug report from 2009 about this problem, and it is still unsolved. My solution to speed up the KDE menu was to create a package kde-icon-cache that upon installation will look at all .desktop files used to generate the KDE menu, find their icons, search the icon paths for the file that KDE will end up finding at run time, and copying the icon file to /var/lib/kde-icon-cache/. Finally, I add symlinks to these icon files in one of the first directories where KDE will look for them. This cut down the number of file accesses required to find one icon from several hundred to less than 5, and make the KDE menu almost instantaneous. I'm not quite sure where to make the package publicly available, so for now it is only available on request. The bug report mention that this do not only affect the KDE menu and icon handling, but also the login process. Not quite sure how to speed up that part without replacing NFS with for example NBD, and that is not really an option at the moment. If you got feedback on this issue, please let us know on debian-edu (at) lists.debian.org. Update 2015-08-04: The source of the scripts and associated Debian package is available from the Debian Edu github repository. About two weeks ago, I was interviewed via email about Debian Edu and Skolelinux by Bruce Byfield in Linux Weekly News. The result was made public for non-subscribers today. I am pleased to see liked our Linux solution for schools. Check out his article Debian Edu/Skolelinux: A distribution for education if you want to learn more. Germany is a core area for the Debian Edu and Skolelinux user community, and this time I managed to get hold of Wolfgang Schweer, a valuable contributor to the project from Germany. I've studied Mathematics at the university 'Ruhr-Universität' in Bochum, Germany. Since 1981 I'm working as a teacher at the school "Westfalen-Kolleg Dortmund", a second chance school. Here, young adults is given the opportunity to get further education in order to do the school examination 'Abitur', which will allow to study at a university. This second chance is of value for those who want a better job perspective or failed to get a higher school examination being teens. Besides teaching I was involved in developing online courses for a blended learning project called 'abitur-online.nrw' and in some other information technology related projects. For about ten years I've been teacher and coordinator for the 'abitur-online' project at my school. Being now in my early sixties, I've decided to leave school at the end of April this year. The first information about Skolelinux must have come to my attention years ago and somehow related to LTSP (Linux Terminal Server Project). At school, we had set up a network at the beginning of 1997 using Suse Linux on the desktop, replacing a Novell network. Since 2002, we used old machines from the city council of Dortmund as thin clients (LTSP, later Ubuntu/Lessdisks) cause new hardware was out of reach. At home I'm using Debian since years and - subscribed to the Debian news letter - heard from time to time about Skolelinux. About two years ago I proposed to replace the (somehow undocumented and only known to me) system at school by a well known Debian based system: Skolelinux. Students and teachers appreciated the new system because of a better look and feel and an enhanced access to local media on thin clients. The possibility to alter and/or reset passwords using a GUI was welcomed, too. Being able to do administrative tasks using a GUI and to easily set up workstations using PXE was of very high value for the admin teachers. It's open source, easy to set up, stable and flexible due to it's Debian base. It integrates LTSP out-of-the-box. And it is documented! So it was a perfect choice. Being open source, there are no license problems and so it's possible to point teachers and students to programs like OpenOffice.org, ViewYourMind (mind mapping) and The Gimp. It's of high value to be able to adapt parts of the system to special needs of a school and to choose where to get support for this. At home (Debian Sid with Gnome Desktop): Iceweasel, LibreOffice, Mutt, Gedit, Document Viewer, Midnight Commander, flpsed (PDF Annotator). At school (Skolelinux Lenny): Iceweasel, Gedit, LibreOffice. Some time ago I thought it was enough to tell people about it. But that doesn't seem to work quite well. Now I concentrate on those more interested and hope to get multiplicators that way.